Before you can lose pounds, you must shed weight. 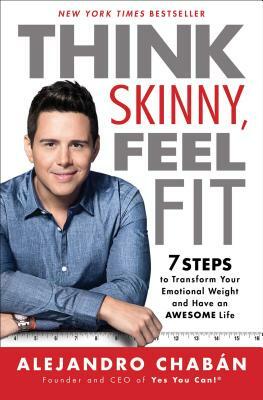 Alejandro Chabán suffered from being overweight as a child and from anorexia and bulimia as an adolescent, and desperately tried to have a healthy body. Then, after trying different diets and exercise regimens, he finally lost 150 pounds. But he discovered that even though his body was thin, in his mind, he was still overweight. This realization inspired him to develop techniques to accept these feelings and transform them into powerful practices. In 2012, this proven method led Alejandro to found Yes You Can!®, a program that has helped thousands of people to follow a healthy lifestyle with a Latin flavor. In Think Skinny, Feel Fit, Alejandro shares for the first time the seven steps that were essential in helping him master his mind in order to transform his body. Using personal anecdotes and examples, Alejandro explains in detail what it means to be emotionally overweight, how emotions and physical well-being are connected, and how best to identify the mental obstacles that weigh down your mind and body. These steps, grounded in positive-thinking techniques, meditation, and self-acceptance and commitment, will help you lead a happier, healthier life. Now you can say "Yes!" to finally taking care of yourself the way you deserve. "Chaban’s story will inspire his devoted fans and also draw in new readers with its openhearted candor and supportive plan." "There are so many layers as to why we overeat… This book will help you peel a few of those. A rare and special book that touches our inner selves with extraordinary courage, authenticity, and beauty. I have seen very few books with this kind of clarity and human depth. It will move you to tears and to joy. It will entertain and delight you, and it will make you a deeper and more compassionate human being. It will transform your life forever." "SPECTACULAR! I laughed and I cried... A tender and daring book that you’ll never forget." I see miracles in my life every day, and Alejandro is one of the people who helped make that happen. This book is good enough to eat and nourishing to the heart. Alejandro Chabán is the # 1 motivational force for our generation. His story is powerful and transformational.